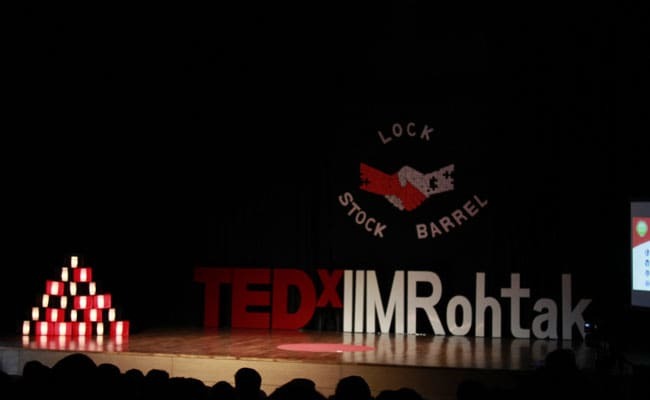 To go 'all in' and 'never give up' was the core idea at the third TEDx event organized by Indian Institute of Management (IIM) Rohtak on Sunday, September 10, 2017. New Delhi: To go 'all in' and 'never give up' was the core idea at the third TEDx event organized by Indian Institute of Management (IIM) Rohtak on Sunday, September 10, 2017. Celebrating the theme of Lock, Stock and Barrel, the eminent invited speakers shared their life experiences wherein they accumulated everything into one single spear point and overcame all barriers to achieve their dreams. At the event, Mr. K. Vijay Kumar, retired IPS officer who served as the Chief of Special Task force of Tamil Nadu - the unit behind the encounter of the brigand Veerappan (which is known as Operation Cocoon), said, "I never asked for big resources, rather tried to put in all my efforts every single time". He said the number of failures don't matter as long as one is ready to fight back. In a moving speech, Dr. Swapna Patkar, author, film producer and entrepreneur, advocated the ideals of individualism. "All my life's education seemed worthless, when I couldn't come to terms with the individual aspirations of my son," she said while adding that happiness is what matters and one who masters that art is the jack of all trades. The woman behind the innovative concept of "JetSetGo", Ms. Kanika Tekriwal, talked about disruptive commercial mobility. She told that the Western world cannot solve the problems of India and it's the Indian millennial which need to come forward and find solutions to accommodate our burgeoning population. She further added that the world is continuously shrinking and at the end of the day we need to develop solutions which the ecosystem supports. Major Vandana Sharma, Kargil war veteran and a corporate leader at present, said that to achieve something extraordinary, one has to move out of one's comfort zone. "If one is determined enough, gender cannot become a barrier," she added recalling her days in the army. Guinness World Record holder nail artist, Mr. Wajid Khan was the most celebrated speaker at the event. Mr. Khan also has his name featured in the Limca Book of Records and Asia Book of Records. He has also been commissioned to design a unique sculpture for the2022 FIFA World Cup, to be held in Qatar. "Knowledge dissemination is no longer restricted to books only; technology is ushering in paradigm change and shaping the thoughts and view point of human beings," Director IIM Rohtak, Dr. Dheeraj Sharma sadi in his welcome address. The TEDx Program is designed to help communities, organizations and individuals to spark conversation and connection through local TED-like experiences. At a TEDx event, TEDTalks video and live speakers combine to spark deep discussion and connection in a small group. Notably, TED is a nonprofit organization devoted to Ideas Worth Spreading, usually in the form of short, powerful talks (18 minutes or fewer) delivered by today's leading thinkers and doers. TEDxIIMRohtak 3.0 was supported by GAIL and Valvoline Cummins Private Limited..